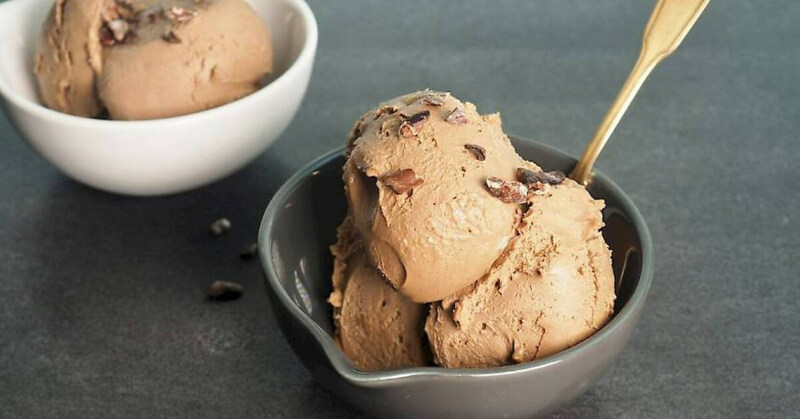 This is a super creamy irresistible chocolatey fudge ice cream dessert. It’s dairy-free and made from real ingredients, and by using olive oil like the Italians you create a very creamy texture. There’s no need for a machine, it’s whipped up in seconds using a blender. You can control what goes into your ice cream when you make it yourself. 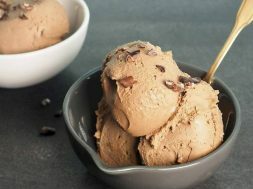 Homemade ice cream freezes firmer than store-bought as it doesn’t contain additives to keep it soft to serve straight from the freezer. I’m also happy to forgo the refined sugars and the artificial colours and flavours. Pour the mixture into a 21 x 10cm silicon loaf pan and smooth the top. Cover with cling wrap or foil (but don’t have it touching the mixture) and place in the freezer for 3 hours or until frozen but the still having its fudgy texture. If you plan on storing the ice cream in the freezer to use later it will need to be blended twice to prevent it going icy. Remove the mixture from the freezer after 1.5 – 2 hours or once it’s half-frozen and scoop back into the blender. Blend for 10 seconds to aerate the mixture (I use the tamper stick to assist me). Place back into the pan and smooth the top. Cover and return to the freezer. Once the ice cream has been frozen for several days you will need to set it out at room temperature for 20 – 30 minutes to soften a little before serving.